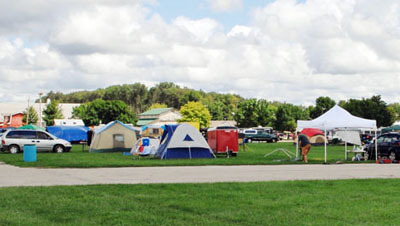 LaPorte County Fairgrounds has camping available for visitors and exhibitors. 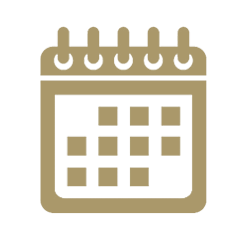 Be sure to make your campground reservations early for FAIR WEEK! Camping trailer and RV parking sites are restricted to the campgrounds only. Special exception to this rule is on approval by Fair Board and/or Fair Manager only. No campground site is to be sub-let to anyone for any reason or purpose. Only one car, truck, SUV, etc. is allowed on site. There may be one recreational vehicle allowed, which must have a permit obtained through our office with appropriate proof of insurance stating your unit is covered off of your premises. All livestock trailers must be stored away from the immediate campsite and in the area designated by the Fair Board. Issued permits must be displayed so as to be visible to Emergency/Security/Fair personnel at all times. All units must be checked in prior to parking or setting up on designated site. ANY SITE THAT IS SPOTTED WITHOUT THE APPROVAL OF A FAIR BOARD REPRESENTATIVE IS SUBJECT TO BEING TOWED! All damage to electric pedestals, water hydrants, sewage receptacles, electric panels, showers, toilets, buildings, etc. must be immediately reported to Fair personnel. All campers must comply with State/Local Health Standards and keep their site/surrounding area neat and clean of all garbage/rubbish. Fair management reserves the right to at any time revoke any permit and evict the permittee and all other persons on site if there is dangerous, threatening, loud, obnoxious behavior or any behavior that interferes with the health, safety and welfare of other campground permittees. Quiet times in the campground are from 11pm-7am. ABSOLUTELY NO ALCOHOL IS ALLOWED ON THE FAIRGROUNDS! Person renting camping site must be at least 21 years of age! Fair admission passes and additional parking passes are an additional charge and not included in the campground fees! If you fill out forms and pay online, please be sure to print a copy of your receipt and bring it with you for proof of payment. Full Hook Up (electric, water, sewage) space is approximately 20’x35’. One air conditioner is included in this price. Water/Electric Hook Up (NO sewage!) One air conditioner is included in this price. Primitive Area (tents no larger than 144 square feet, no electric, no water, no sewage). *Please note that your reservation will not be confirmed until payment is received. The LaPorte County Agricultural Association d/b/a LaPorte County Fair is not responsible for damages / losses of any amount or nature due to power outages, power surges, water supply, sewage failure, faulty hookups, acts of God, irresponsibility on part of permittees. I attest that I have read and understand this application. By checking the box below, you agree that this is a legally binding document. YES, I attest that I have read and understand this application. *Permits must be picked up BEFORE fair week. Include all names and ages. Download forms below if you prefer not to complete online.